Peptide CIELKSELGRKWHKASN, corresponding to amino acid residues 172-188 of human P2RY14 (Accession Q15391). 2nd extracellular loop. Homology Rat, mouse - 15/17 amino acid residues identical. 1-3. Anti-P2Y14 Receptor (extracellular) Antibody (#APR-018), (1:200). 4-6. Anti-P2Y14 Receptor (extracellular) Antibody, preincubated with the control peptide antigen. Mouse kidney sections (Azroyan, A. et al. (2015) PLoS ONE 10, e0121419.). 5-10 µg antibody / 1x106 cells. Mouse thymocytes (Kook, S.H. et al. (2013) Cell Death Dis. 4, e703.). Chambers, J.K. et al. (2000) J. Biol. Chem. 275, 10767. Skelton, L. et al. (2003) J. Immunol. 171, 1941. P2Y14 belongs to the P2Y receptor family that is part of the G-protein coupled receptor superfamily. To date, eight functional mammalian P2Y receptors have been identified: P2Y1, P2Y2, P2Y4, P2Y6, P2Y11, P2Y12, P2Y13 and P2Y14. The P2Y receptor family mediates the effects of extracellular nucleotides such as ATP, ADP, UTP, and in the case of P2Y14, UDP-glucose. UDP-glucose, as with the other nucleotides, can be released to the extracellular milieu as the result of cell damage or by regulated non-lytic mechanisms. P2Y14 is expressed in several tissues including the brain, lung and several cells of hematopoietic origin such as T lymphocytes and dendritic cells. The exact function of this receptor in the different tissues has not been clearly established but an involvement in chemotaxis, maturation of immature dendritic cells and neuroimmune regulation has been suggested. Expression of P2Y14 receptor in mouse kidney.Immunohistochemical staining of mouse kidney sections using Anti-P2Y14 Receptor (extracellular) Antibody (#APR-018). P2RY14 staining (green) is detected in intercalated cells in the cortex and co-localizes with V-ATPase B1 subunit (red).Adapted from Azroyan, A. et al. (2015) PLoS ONE 10, e0121419. with permission of PLoS. Anti-P2Y14 (extracellular) Antibody (#APR-018) is a highly specific antibody directed against an epitope of the human protein. The antibody can be used in western blot, immunohistochemistry, and indirect flow cytometry applications. The antibody recognizes an extracellular epitope and is thus highly suited for detecting the receptor in living cells. It has been designed to recognize P2Y14 from human, rat, and mouse samples. Expression of P2Y14 receptor in mouse kidney. Immunohistochemical staining of mouse kidney sections using Anti-P2Y14 Receptor (extracellular) Antibody (#APR-018). P2Y14 receptor staining (green) is detected in intercalated cells only of the cortex (A) and medulla (B). 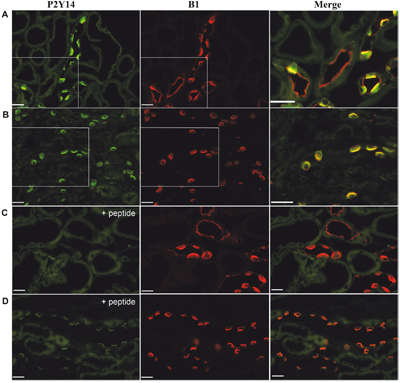 P2Y14 receptor co-localizes with V-ATPase B1 subunit (red staining) in intercalated cells but not in distal tubule cells. Pre-incubation of the control peptide antigen, abolishes P2Y14 staining in both cortex (C) and medulla (D). Adapted from Azroyan, A. et al. (2015) with kind permission of Dr. Breton, S. of Center for Systems Biology, Massachusetts General Hospital/Harvard Medical School, Boston, Massachusetts, USA. Rat brain microvascular endothelial cell lysate (1:200). Li, F. et al. (2016) J. Ethnopharmacol. 185, 77. Kook, S.H. et al. (2013) Cell Death Dis. 4, e703.